The Manchizzle: I am the god of hellfire! Remember that fire on Lever Street a few weeks back? Some of the folks who work in the damaged buildings haven't gotten back into their offices. Others are facing some heinous financial consequences due to water, smoke, burning or firefighting damage. Fortunately, the promised benefit concert is going on this Sunday, June 3, from 4-11pm in Stevenson Square in the Northern Quarter. It's being organised by D.Percussion folks Ear to the Ground, who, in cooperation with CIDS, will distribute all proceeds to affected businesses and the city fire department. And yes... they've embraced the camp, funny side of having the building that houses your offices almost burn down, have called the gig Burnt to the Ground, and promise a flame-themed stage and fire trucks. 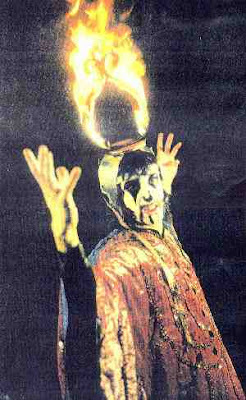 The best part is that the Arthur Brown, he of The Crazy World of Arthur Brown, will be performing his scary 1968 song "Fire." That's a picture of him above. Let's all pray that he brings his awesome flaming fire helmet. Also performing will be a whole slew of musical acts including... Mr Scruff, The Unabombers (who've graciously put up with their 24 Lever St. offices being the alternate entrance for the entire building for weeks), Polytechnic, Broke n' English, Marc Riley, Rita & Sue, Magic Arm, Peter & the Wolf, The Mekkits and the deejay stylings of clans Fat City, Tramp, El Diablo, Rockers, Jayne Compton, Solja and Flotsam & Jetsam. Loads of these people work in or around the buildings, or are otherwise connected with them. It'll also be worth going to see if they can actually fit 5,000 people in Stevie Square. £2 suggested donation. It would be a rare treat if Arthur Brown brought his helmet with him, but he is still a fantastic sight to see and one of my heros. Pity I am working on that night boo hoo.